Knowing about trends is vital for future planning of any business. For businesses in the CAD, CAM, CAE, PDM and PLM industries this annual survey is designed to assist your planning for this year and beyond. The annually published public report is high level and many deeper insights are available from the full data set. If you are interested in more detailed analysis of the data, for example by region, industry or Software Vendor please contact us. We would also love to hear any feedback you may have on the survey. We perform it annually so any suggestions, to improve the next version and make it more useful, would be most welcome. Future planning is key for any business - and through this survey we want to assist you in that process in 2016 and beyond. Strongest growth potentials are in ‘Pay As You Go’, ‘Cloud based CAD’, ‘Augmented/Virtual Reality’, ‘Mobile Access to CAD’, ‘Advanced real time Rendering and Visualization’ and ‘3D Printing’. 3D Modelling is widely adopted but 2D Drafting remains important. Two thirds of users still rate 2D drafting highly important (8, 9 or 10/10). 39% of design work produces 2D drawings, 27% 3D models and 34% both 2D drawings and 3D models. 2D drawings automatically generated from 3D CAD or BIM models are important as is more software development on 2D drawing. CAM software usage increased 37% in the last year. Almost 70% of those using or planning to use CAM think it’s important to have machining instructions automatically generated from 3D CAD models. 6 in 10 of them also want to see more software development effort on CAD/CAM integration. Concurrent Engineering (72%) and PLM (67%) have good growth potential in the coming 3-5 years. BIM is showing a surprising amount of flux – predicted growth missed and a drop in perceived importance. Clear ROI on CAD Software upgrades demonstrated. 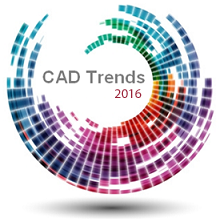 Nearly 60% of CAD users are downloading 3D CAD models monthly, 50% of Manufacturing users download multiple times per month. Significant drop in those never downloading to just 10% of CAD users. Knowing about trends is vital for the future planning of any business. For businesses in the CAD, CAM, CAE, PDM and PLM industries this annual survey is designed to assist your planning for this year and beyond.